Squirrel Hill is a prosperous and easygoing middle-class neighborhood located east of Downtown Pittsburgh. The area features an established shopping district filled with small businesses, evenly mixed with local and national chain stores. Best know as a center for Pittsburgh’s Jewish community, it caters to diverse group of residents in age, income, profession and ethnic background. In the beginning, Squirrel Hill was the ‘burbs, and it still retains its wide, leafy residential streets and beautiful brick and stone homes. Squirrel Hill is served by the Pittsburgh Public School District and several prestigious private schools. Walk-ability: Squirrel Hill ranks as a Walker’s Paradise with a walk score of 98 out of 100. One trip to the area makes it easy to see why. Almost every imaginable need is located in a 10 block area. Local favorites like The Squirrel Hill Café (also known as the Squirrel Cage) and Gullifty’s mix with boutiques, bookstores, coffee shops, a library, cinema, bike shops and almost anything else you could imagine. Commute: Squirrel Hill is centrally located less than four miles from downtown and a mile and a half from Oakland. Many of the roads are wide and have bike lanes or sharrows (lanes that are shared by both cars and bikes) to make commuting by bike easy. The neighborhood is well served by PAT buses with stops on Murray and Forbes Avenue and near Schneley Park. For students, there is an intercampus bus service that picks up near Chatham University and drops off in Oakland. Outdoor Space: The tree-lined streets and inviting front porches are repeating features of the neighborhood which is sandwiched in-between two large city parks. Schenley Park to the west and Frick Park to the east give residents over 1,000 acres of trails, fields, streams and playgrounds within a few miles of their homes. The 151-acre Frick Woods Nature Reserve offers an opportunity to see Pennsylvania's native plants in its meadows and woodlands. On-road bike lanes run throughout the area and off-road trails in Frick and Schenley Park are good for mountain biking. Finally, sidewalks make for lovely evening strolls. Environmental Activism: With its diverse mix of families, students, artists, immigrants, liberals, intellectuals and young professionals, Squirrel Hill is almost predestined to be a neighborhood full of optimistic environmental activism. The Frick Environmental Center serves as the starting point of an extensive trail system—including a handicap-accessible trail through the woods. It is used for environmental educational programs, day camps, school and family programs and nature walks. The Group Against Smog and Pollution (GASP) a non-profit citizens’ group in Southwestern Pennsylvania working for a healthy, sustainable environment is based in the neighborhood. As is The Urban Forest Committee of the Squirrel Hill Urban Coalition, which works to establish, maintain and protect the shade tree canopy on every street in the Squirrel Hill residential and commercial districts. Housing: Squirrel Hill is the traditional neighborhood that all the proponents of New Urbanism and TNDs (Traditional Neighborhood Developments) seek to recreate in many of today’s newer projects. The homes have a wonderful mix of shapes, styles and materials. One will find small and large single family homes, brick mansions, duplexes and apartments all sitting next to each other. Because of this, the streets of Squirrel Hill have a culturally and economically diverse population that includes a harmonious mix of lifestyles. Traditional style brick and stone homes sit next door to contemporary urban homes which sit next to charming bungalows. While much of the existing housing stock is older, and likely in need of energy efficient updates, the neighborhood is also home to one of Pittsburgh’s first sustainable development projects. Summerset at Frick Park sits on a reclaimed industrial site near the back of Squirrel Hill, along the edge of Frick Park. This plan of 300+ newer homes seeks to capture much of the traditional neighborhood in a new housing plan, and incorporates every style home from condominium to estate. The homes are built to be highly energy-efficient with tests showing they are 30% more efficient to heat that a typical new Pittsburgh home. An expanded selection of green living features are available for buyers interested in sustainable design materials and technologies, including tankless water heaters, tile and carpet made from recycled content and low VOC countertops, cabinets and paints. Homes in Squirrel Hill sell for an average price of $235,000 but range from well over a million to around $100,000. 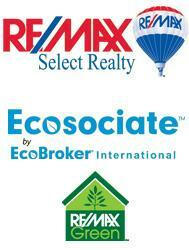 Want to find a home in Squirrel Hill that is good for your family, wallet, health and planet? Call Christa Ross from RE/MAX Select Realty, your certified green agent and RE/MAX green specialist at 724-309-1758 or visit my website at www.greenhomespgh.com.